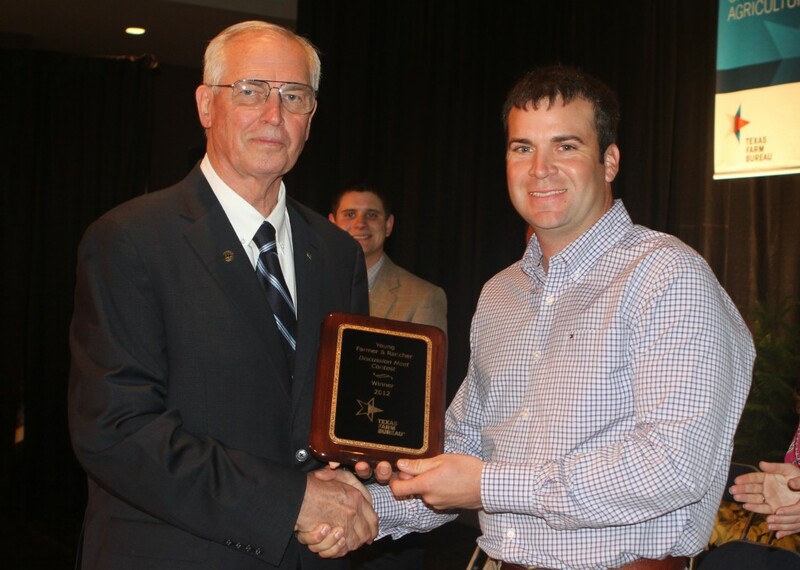 WACO, Texas—Layne Chapman, a Wilbarger County farmer, won the 2012 Texas Farm Bureau (TFB) Discussion Meet during the 79th TFB Annual Meeting. The winner was announced during the meeting’s general session Dec. 2 at the Waco Convention Center. TFB’s Discussion Meet encourages problem solving through cooperative discussion among young farmers and ranchers. Four contest finalists discussed how Farm Bureau can help prepare its members, both young and old, for transferring family farms and ranches to the next generation during the final round of competition. The finalists held a 25-minute conversation on the topic and were scored based on their speaking skills, effective problem solving and cooperative communication with other contestants. Chapman will receive $5,000 from Farm Credit, as well as an all-expense paid trip to compete at the American Farm Bureau Federation (AFBF) Discussion Meet during the AFBF Annual Meeting in Nashville, Tenn., in January. The Discussion Meet finalists were Joe Barbour of Williamson County, Dane Elliott of Live Oak County, and Elizabeth Wagner of Lavaca County. The three finalists will receive a power tool from Grainger and a pair of Justin boots. TFB President Kenneth Dierschke congratulates Layne Chapman of Vernon for winning this year's Discussion Meet.